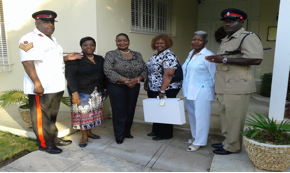 From left to right: Sergeant 1401 Bertram Carey, Revising Officer, Consul Deborah Saunders, Her Excellency Alma A. Adams, First Bahamian Woman Ambassador to the Republic of Cuba, Bahamian Returning Officer, Ms. Raquel Greene, Attaché Annie Carey and Inspector of Police Alexis Roberts Sr.
HAVANA – The Polling station established for the Overseas Advanced Poll of The Bahamas for the MAY 2017 GENERAL ELECTIONS, took place on Wednesday May, 3rd, 2017 at the Embassy of the Commonwealth of The Bahamas in Havana, the Republic of Cuba, located at 3006 5th Avenue e 30 y 32, Miramar, Playa, Havana, Republic of Cuba. At precisely 8:30 a.m., the moment became truly historic and exciting, as the First Bahamian Woman Ambassador to the Republic of Cuba, Her Excellency Alma A. Adams stuffed her Ballot into the Ballot Box, under the watchful eyes of the Bahamian Returning Officer, Ms. Raquel Greene, the Revising Officer, Consul Deborah Saunders, Attaché Annie Carey and ably assisted by the two fully uniformed Bahamian Police Officers, Inspector Alexis Roberts Sr. and Sergeant 1401 Bertram Carey. Once the doors were opened at 8:00 a.m., today, for the first time, a total of eight (8) Bahamians led by the Diplomatic Staff, in the person of Consul Deborah Saunders, who was the first Bahamian national to proudly cast her vote, was followed by five (5) Bahamians studying in Cuba, who exercised their rights as citizens of the Commonwealth of The Bahamas, to vote overseas for the candidate of their choice. This powerful landmark occasion, once again, confirms that the Democratic Principles continue to be respected and practiced with integrity and determination in our Dear Bahamaland. 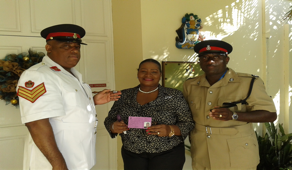 From left to right: Sergeant 1401 Bertram Carey, Her Excellency Alma A. Adams, First Bahamian Woman Ambassador to the Republic of Cuba and Inspector of Police, Alexis Roberts Sr.